I don’t want this to devolve into another well-worn cranky diatribe against being positive or encouraging. Far from it. I think that the intent behind all of these messages is awesome, and constantly aspiring for greatness is a common thread amongst all of the really successful musicians I know. In my own musical development, I know that my best growth has happened when I had a specific and ambitious goal in mind. But what I think gets left out of the equation too often are the intermediate steps – the short term, manageable, incremental goals that add up to accomplishing your dreams. It’s great to set a lofty goal, but there is some danger there. There have been a handful of times as a teacher where a well-meaning student has written or verbalized a manifesto about his or her goals, replete with bold statements about fantastic achievements over unreasonably short periods of time, as though merely positing the thought was worthy of admiration and respect. Usually they have nebulous descriptions of what they’re trying to accomplish (ie, “I want to master (blank)”, or “I want to be able to (blank) well enough to get a gig”). And these manifestos seem to almost always be followed pretty quickly by the sobering realization that it’s going to be more work than they realized, and that they can’t sustain the effort needed to do what they set out to do in the time frame they had specified, and then finally, abandoning the plan together. The root of all of this is very healthy: a genuine desire to be better. But students would be better served picking one large “long term” goal, and then identifying a series of corresponding “short term” or “medium-term” goals - some benchmarks to reach that lead up to checking off the final box. Identifying these benchmarks can create a satisfying sense of accomplishment that can quench that thirst for tangible improvement and keep you on pace towards a broader task. There’s nothing wrong with dreaming big, but being aspirational in and of itself won’t cut it. Here are some easy concrete, short- or medium- term goals that can motivate your practice. Schedule a recital or a gig, with specific repertoire that will address the musical concepts you want to refine. Be careful not to schedule it so soon that you don’t have the time to comfortably develop your new skills – give yourself enough space to make sure you can pull it off. Conversely, don’t give yourself the option of cancelling if you feel the pressure a few weeks ahead of the performance. Want to get better at playing modal jazz? Work up two sets of Wayne Shorter compositions and bill it as such on the event flyers. Classical saxophone articulation? Program a recital including some baroque transcriptions. A word of caution, though: if you’re programming primarily or solely to address deficiencies, this might be better saved for a non-degree recital. Last month I had the distinct pleasure of hanging with my friend and All-Universe First Team Saxophonist Nathan Bogert and working with his saxophone studio and the jazz ensembles at Ball State University. Dr. Bogert and I have become close since meeting two and a half years ago when he gave a guest recital at UMKC while I was working on my doctorate there. While having dinner in Muncie, Nate told me that he had scheduled that recital in Kansas City as a way to keep himself in shape, musically. He had finished his doctoral work at University of Iowa and had found another non-music related job that he enjoyed. “I could feel myself getting more invested in the job and getting too comfortable musically, so I booked that recital at a place where I knew I couldn’t cancel and I would have to be sharp”, he said (I’m paraphrasing). Of course, Nate has very high artistic standards and whatever he would perceive as “getting too comfortable” is probably better than anything most of us could ever dream of – but I digress. It was illuminating to me to hear someone as accomplished as Nate talk about voluntarily seeking out a playing opportunity solely to push himself artistically. Pictured: Dr. Nate Bogert killing music. There’s no motivator like knowing your performance will be documented permanently, for better or worse. Listen, the idea of competing at music is kind of silly if you think about it too much. I remember Steve Lambert joking, en route to our college jazz ensemble’s performance at the University of Northern Colorado Jazz Festival, that we were on a quest to “win jazz”. But the real benefit of a competition, whether it be live or an audio submission, is the growth that comes with preparing for it. My most maniacal preparation and subsequent improvement has come when I was preparing for North American Saxophone Alliance competitions, submission for Downbeat Student Music Awards, and my master’s and doctoral graduate auditions. Any successes in those events were always really ancillary benefits to how much better I got preparing for them. Further, whether it’s fool’s gold or not, the confidence you can glean from “hanging” with some of the best in your field can give you a self-assurance that, in moderation, can be used as a springboard to more valuable things. My pal Hermon Mehari is a great example of the benefit of competitions, and that’s one of the least “competitive” great musicians I’ve ever met. I’ve literally never heard Hermon compare himself to anyone else – either positively or negatively – as long as I have known him. I don’t want to speak for him, but it always seemed that his preparation for those competitions always went just a little deeper and seemed to engender a different level of self-reflection and honest evaluation. His bigger, more valuable successes – like the album he’s due to release in the coming weeks – are to me at least partially assisted by some of the growth and the connections he made in those competitions. 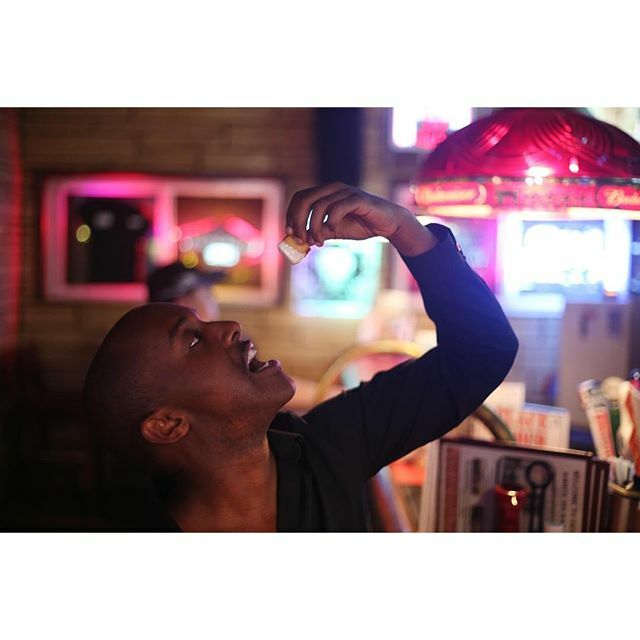 Did I use this Hermon anecdote expressly as an excuse to share this photo of him eating a cheese curd drenched in ranch upon his visit to Wisconsin last month? You decide. In most cases there is already a template in place for getting to where you want to get, musically. Figure out what parts of the journey of musicians you admire you can replicate in your own development. At UWEC a very bright young jazz trumpet player named Cody Longreen met with me in my office in his first few weeks as a freshman last year. He told me one of his big goals was to have a major label CD release under his own name by the time he was either 25 or 30 (I can’t remember the exact timeline, now). I told him to look at other trumpet players who had done that in recent years, and identify some of the building blocks towards those players had towards that goal (for practical purposes, I’m thinking of “major label” jazz CD releases as anything with significant radio airplay or media coverage that isn’t independently released, because there’s gosh darn near no-such-thing as a major label jazz release anymore). In the case of Ambrose Akinmusire, he won the Carmine Caruso Competition (hey, there’s that word again!) and the Monk Competition, was admitted into the Monk Institute graudate program, and had a full CD’s worth of original music (with a standard thrown in) for his first recording. Luckily in our case, we have an even more relevant model, as UWEC alum John Raymond has had major radio airplay and media coverage for his excellent recent releases on Fresh Sound New Talent and the Minnesota-based Shifting Paradigm Records. John recorded his first album before graduating at UWEC - a fairly humble release from what I understand. So we identified a few building blocks: start entering some competitions (Cody was a finalist in the National Trumpet Competition last year after that conversation), begin writing music so you have enough to choose from to fill out an album when it’s time (we started with some contrafacts this summer), and try and put something preliminary out while you’re young to build up towards trying to pitch to a label when the time is right. I can’t speak for Cody but I think these more immediately attainable goals have given some needed perspective towards the bigger, long-term goal. Finally, and maybe most importantly, I think it’s important to fall in love with the day-to-day process of working towards a big dream. The stark truth is that many times the big dream is never fulfilled, for any number of reasons that may or may not even be under your control, even if you put in the work. You have to see value in the day-to-day pursuit and be fulfilled by that process, or your time will feel wasted if the end goal is the sole redeeming factor. I remember learning this lesson from my high school buddy Patrick Lee. Patrick turned himself into a great high school basketball player (all-conference, right Patrick?) mostly through pretty tenacious workouts in the summer. I was, on the other hand, pretty average, mostly because I just didn’t want to put in the work. I wanted to be lazy in the summer and watch TV and eat generic Chips Ahoy from Aldi. When the season rolled around and Patrick was in impeccable shape, with new post moves to boot, I remember one time asking him how he “motivated himself” to “stomach” all that extra work, lifting weights and playing pickup games all summer. He looked at me like I was crazy. I realized that none of that work was actually work for Patrick; he wanted more playing time and to be better, but he wasn’t obsessed with the end goal so much as he loved the day-to-day process of going to the gym, regardless of the end result. I couldn't dig up any pictures of Patrick playing hoops in high school, so here's proof of my Chips Ahoy-addled high school body trying to play basketball. Why didn't my parents tell me to get my haircut? This is something that musicians and music educators would do well to ask themselves about sometimes. Is the juice going to be worth the squeeze if we don’t “win”, or if we don’t accomplish what we set out to? I love that the Essentially Ellington competition exists, but is it worth it to restrict your ensembles to only learning 5 Duke Ellington compositions for a year’s time, if that’s what it takes? Is entering that concerto competition at school going to be worth it if you practiced one piece for a year in lieu of other things that might have better contributed to your growth, especially if you don’t win? So, TL;DR? Dream big, but don’t be afraid to dream medium, too.